That darn Illudium Q-36 explosive space modulator never works properly! I wasn't worried about all the Mayan calendar/Doomsday stuff until I heard the U.S. Government issued a statement that the world would not end today. "John Carter? Never heard of him." I hate to break it to everyone, but the world DID end as predicted. All I can say to folks who have not noticed any change is, "Welcome to Hell." Love Marvin. Thanks for the laugh. 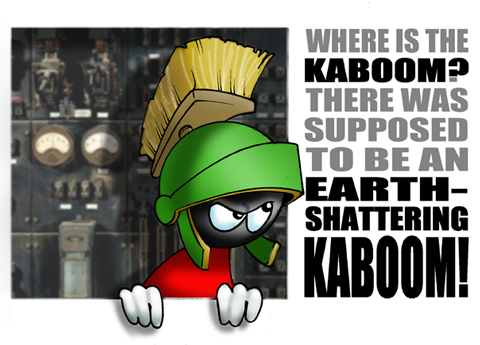 There is a very similar illustration moving around the internets today with the line "Where's the Kaboom? There's supposed to be an earth-shattering kaboom!" with the brush-headed guy looking into a telescope. I saw yours first so I'll consider it the original. The other is just a poor copy. Yep, a lot of disappointed lemmings today. Alas, Marvin's view of Venus is still blocked. Marvin, you see this loose red wire here? Well, you just connect it like so KABOOM!!! This page contains a single entry from the blog posted on December 21, 2012 12:01 AM. The previous post in this blog was Non Compost Mentis.